Shimano's RT81 rotors embody Shimano's signature Ice-Tech Technology. Ice-Tech produces 25% more braking power through achieving a high system stiffness and incredible cooling power. The 3 layer rotor features an aluminum core between stainless steel outer plates. This configuation quickly and efficiently dissipates heat from the exterior, drawing it away to cool into the atmosphere using the aluminum carriers and cutout winged design. With better heat dissipation, there is more consistent braking power. Centerlock Rotors mount on Centerlock hubs only (SM-RT96 lockring for QR and 12mm hubs included, HB20 lockring is required for 15mm and 20mm thru-axle hubs, sold separately). Will not fit on standard 6-bolt hubs. Ice-Tech heat-shedding technology ensures consistent, predictable braking. Been using the Shimano RT64 SLX rotors with SLX brakes for this past summer and braking was fine. The Ice-Techs are true out of the box, great stopping power and better modulation. Highly recommend them if money is not an issue. They work with allmodern Shimano brakes, M615 Deore, M675 SLX, M785 XT, XTR, ZEE.People also installed them with Avid and Hayes brakes. I weigh 230-240 lbs without my backpack. Even though I ride trail I think the added stopping power of the large rotors is worth for bigger riders. Let the average mountain biker pipsqueak use the puny 160 and 180 rotors. Big dudes should have big rotors. Theres not much to say about shimano brakes except they rule. To get the benefits of this rotor you need shimano brakes with ice tech pads. When paired these discs are powerful,fade free, and quiet as a mouse in all conditions in any scenario. Gave 4 star cuz i havent tried the RT99 rotors. The rotors work great, and the 203mm rotors deliver noticeably better stopping power than my 180s. They come with lockrings, which can be installed with a cassette tool; however, the supplied lockrings will not fit over 15-20mm axles. Shimano offers lockrings for larger axles, but they must be purchased separately and installed with a bottom bracket tool. Good power, less fade with prolonged braking. Would have given it 5 stars if they would have included the lockring for 15/20 thru axles. Great product, but they should all come with the externally splined locknut. I don't even understand why there needs to be two different designs for the locking nut on these, but maybe someone will enlighten me. The only reason this didn't get 5 stars is because it came with the internally splined lock-nut which doesn't work with a 15 mm front thru axle (at least not with any of the tools I've seen). I had to pay $10 extra per axle to get the externally splined lock nut that would allow me to install it on the front, and use a common tool for both front and rear. (it was either that or start grinding away at one of my cassette tools). smooth braking, rotor runs true and flat. Great stopping power when descending Mt. Mitchell! Hard to beat. Centerlock mounts up real easy. Nice and true right out of the box. No dicking around. Great performance. The 99’s look cool, but the big fins are just overkill for my purposes. It's a centerlock (which are awesome to install) rotor. And it doesn't squeek like some other brands. Easy install, stops on a dime. Shimano got it right using the same tool to mount a cassette for mounting the disc. I have this disc on another bike and love it. I'd recommend to anyone. Youll be happy with these rotors! Awesomeness that bolts right on! Keep cool while looking cool. They are brake rotors... really good ones! Didn't think it could happen but a few weeks spend riding in Finale shreded some rotors. I probably break too much. These installed super easy, work fantastic and if they last several years like the last one are well worth the investment. It’s Shimano brakes. Pretty much faultless. Look good, light weight. I was unsure that I was getting the correct product and the customer service team at Jenson made sure that I got the correct rotor. I also got the shipment really quickly and since I was a little nervous that I was not getting the proper rotor in the first place I was extremely happy to see that they were correct when I put them on my wheels!!!! !Thanks guys!!! As described ice tech doesn't overheat as much as my previous rotors so less screeching when descending long hills like GMR and crystal lake. This is best centerlock rotor foe ypur hard earned $. Nice product. Light weight and great braking performance at an affordable price. Great sync up with XT hubs for a clean wheel build. This is the third set I have bought for various bikes in the family and it just gives great performance in a descret way. Best value without compromising performance. I liked these rotors so much I'm putting them on my second bike. Combined wit XT brakes these rotors have tons of power without sacrificing control. And they are also super quiet. Great buy from Jenson as well at just 24.95 each. Awesome deal! We bought some studded snows on some Stans Rims and needed a read 160mm disk to match the WTB rim and disc rotar. This was exact and perfect. Now a quick swap for winter riding! Thanks so much! Great Rotors at even better price! Solid rotors and excellent value. These work as advertised - stay reasonably cool and have sustained braking power when used with either resin or semi-metallic pads. Proper bedding is essential for no squeals. Easy to re-true if you tweak one in a crash (like I have) - just requires patience, proper tools, and good lighting. Using these with RS-BR805 calipers. 2.5k miles on first set and lots of life left in them. Love 'em! Shimano centerlock rotors are super easy to install, and a good price for a lightweight race ready component. Lightweight, inexpensive, makes your bike stop. All good things! It is a great product, elegantly finished. The service was excellent. However, I had some difficulty in obtaining the information regarding the type of lockring for the front hub. Quick delivery, and the packaging protected the parts well. Great stoping power at a great value. Great stoping power at a great value. Tested on an all-day enduro race. No fading or overheating problems. I recommend it. My 2017 disc Roubiax rotors wore to the wear limit and a bit under in over 1.5 years. I replaced the front and rear discs, torqued to spec. and they work just fine. Ice tech rotors are great. My LBS said they are great and never have problems with them. Rotors were warped on a used bike I bought. These were the identical replacements, and the price for this model was by far the cheapest of all the sites I checked. Great value for money. After building up bikes with SRAM, Magura and Shimano brakes, I'm going 100% Shimano (when it comes to hydro disc). Good price, great performance! The Shimano XT Icetech center lock rotors are a breeze to install and perform superbly with my SRAM Rival Hydro brakes. Best bang for the buck! Reasonable weight, strong construction and easy to mount. Offers good stopping power in all conditions. Bought XT brakes and with this rotors the improvements are noticeable. My breaks are rock solid and reliable. Theres not much to say about shimano brakes except they rule. To get the benefits of this rotor you need shimano brakes with ice tech pads. When paired these discs are powerful,fade free, and quiet as a mouse in all conditions in any scenario. These are great rotors. Unfortunately, they're an expensive design to manufacture, as the retail price reflects. These are a good option if you're looking to replace the centerlock rotors on your bike, but if you have a six bolt setup, there are plenty of other (more cost effective) options out there. Will these rotors work with a 15mm frnt. axle and 12x142 rear axle? 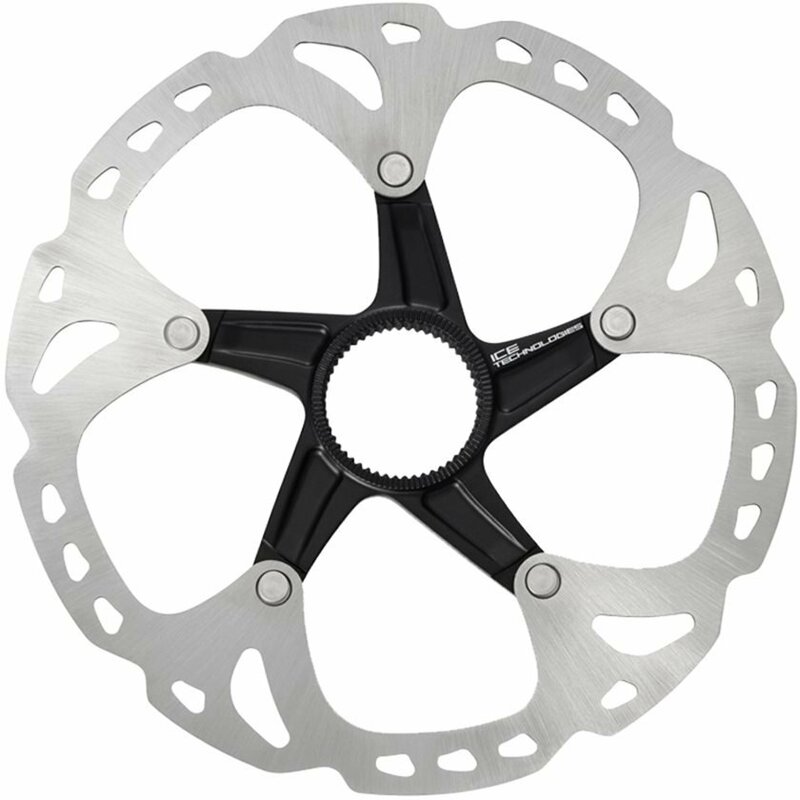 With this rotor fit the XTR M988 Trail MTB Disc Wheelset? The wheelset is 15mm from and normal skewer in the back. if so with they fit as is or will they need an different lockring? BEST ANSWER: Yes this rotor fits Shimano centerlock hubs. The lockring that comes with this rotor will fit the rear hub. The 15mm front hub will need the locking that uses the external bottom bracket tool to install; the Shimano HB-20 one. The type of lockring that uses the cassette tool to install will not fit over the axle. This is a center lock rotor, first make sure that your hub is center lock and not 6 bolt. Any of these shimano centerlock rotor will fit your xtr m988 wheelset. Just be sure that you have the lock ring that goes with it. you should be fine on the rear hub but I'm pretty sure you will need SM-HB20 lockring on the front... I hope this helps. All centerlock brake rotors and hubs should work together. Lockrings should come with the hubs. Hope this helps. would this rotor work with an avid caliper? BEST ANSWER: It depends on the rotor size. The avid calipers (specifically the BB7's) have a large tab that will hit the black spider piece on the 140mm rotor. I believe you can get away with it on the 160mm rotors. The quick fix for making them work regardless is to just file down the tab on the BB7 pad (assuming those are the brakes you are using). So regardless, just make sure that your brake caliper pads don't have a large tab that could hit the spider. I have run a 180 shimano rotor on a Specialized Levo with 203mm brake setup. yes. but i would use resin pads. i have semi metallic equipped with some spyres and they scream. I don't see why not just make sure you get the right size . will these work with Sram Force hydro calipers? Yes, Just make sure to get the right size. Do these come with the Lock Ring for a 15mm hub? BEST ANSWER: A lockring is included, but it will not fit a 15mm hub. You will need to purchase the HB20 lockring. No, you will need to buy that separately. I believe so. Take a look at this video. This is exactly what mine came w/. hubs. The one that came in the package didn't fit. I would assume it would. Ok, I checked and there is a lock ring included with the disc for a 15mm hub, sorry for the confusion. Wait, I think my wheel came with the lock rings, not the actual rotor. Will this XTR81 rotor fit Ultegra hydraulic calipers? I'm looking for something that runs cooler than the discs that shipped with my stock gravel bike wheels. I know the size I need (160mm), just want to make sure this fits with Ultegra calipers. The only thing I could suggest would be to look at your Ultegra rotors and note the MIN THICKNESS and compare. The minimum thickness on the XTR stuff is 0.15mm or 0.006" (6 thousandths). Yes, the rotor thickness should be fine just make sure to order the correct size you need, in this case 160mm. the product is new with box? it goes in box shimano? BEST ANSWER: Yes, the rotor was in an unopened factory box. It was new and works great. The one I bought was new with the Shimano packaging. Yes, new in a shimano box. My current rotor is SM RT 81 S . This one has no "S" . Does it fit in my bike ? Thanks . BEST ANSWER: Yes. You just need to select the right size. The "S" indicates the small 160mm size. Fit should be based on diameter and bolt pattern. So if those are the same then yes. Will this rotor fit in Sram Level TL brakes? does this rotor come with the lockring? BEST ANSWER: Yes, it includes an SM-RT96 Lockring. This is the smaller lockring that installs on QR or 12mm axle rear hubs with the cassette lockring tool (like the Park FR-5). If you are using thru-axle hubs 15mm and up, you will require the SM-HB20 lockring (attached) that has clearance for 15 or 20mm thru-axles, that installs using the external BB tool (like the Park BBT-9). Do the rotors come with a lock ring? BEST ANSWER: Yeah, they should work with that set up. They are individually sold. is this individual or for as a set? BEST ANSWER: Just one rotor.